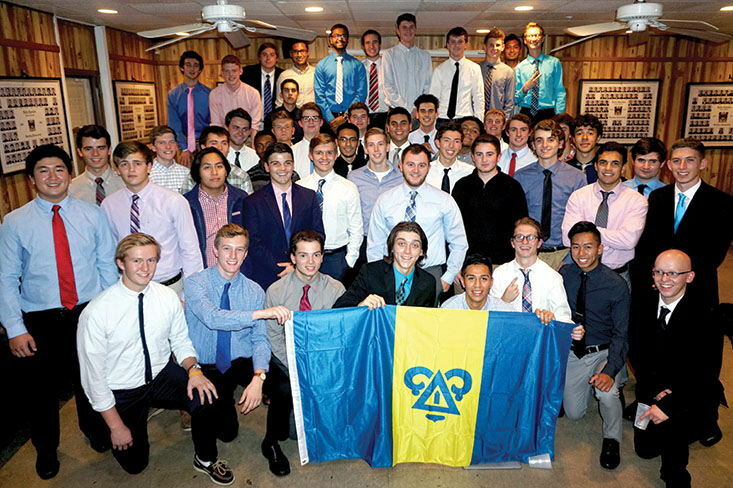 Delta Upsilon's Associate Member Education Program is an eight-week program that introduces associate members to the Fraternity, providing information on DU's history, Four Founding Principles, operations, local history, team building, leadership success and more. Beginning after the Pledging Ceremony and culminating with Initiation, the program is designed to create an engaging and dynamic experience for all associate members. Every DU chapter/colony is expected to fully implement this program. The Associate Member Education Program is a proven success story. Data from DU's Membership Outcomes Assessment shows it develops associate members in a number of key ares, including self-esteem, openness to diversity, ethical decision making and more. In fact, the program received a 2018 Laurel Wreath Award from the North-American Interfraternity Conference for its effectiveness. 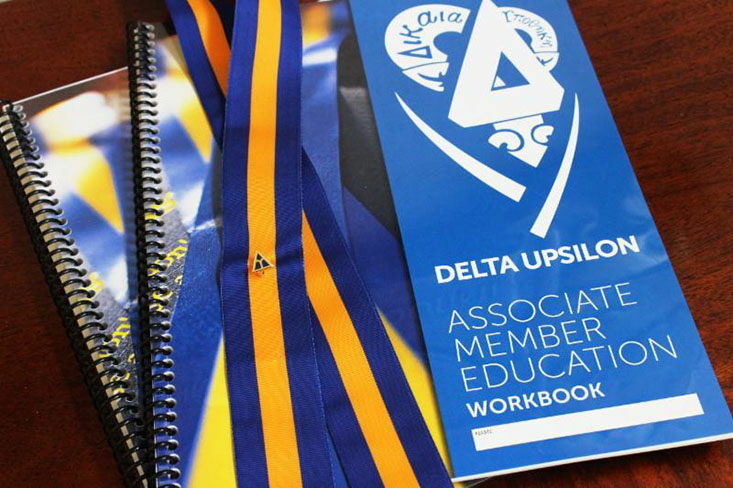 Program Facilitator Guides and Workbooks lead the associate members through an organized and interactive associate member experience that fosters healthy relationships and affinity for Delta Upsilon. From recruitment through holding the Initiation Ceremony, there are a number of things that need to happen, and the Associate Member Education Program is just one of them. Several Executive Board officers and the associate members themselves have tasks regarding reporting and payments. These tasks are critical to onboarding your associate members and making sure they are set up to have the best DU experience. Receiving Cornerstones, Badges, member certificates and more hinge on having reports and fees sent in a timely manner. Download this handy graphic designed to help you follow each step of the process. 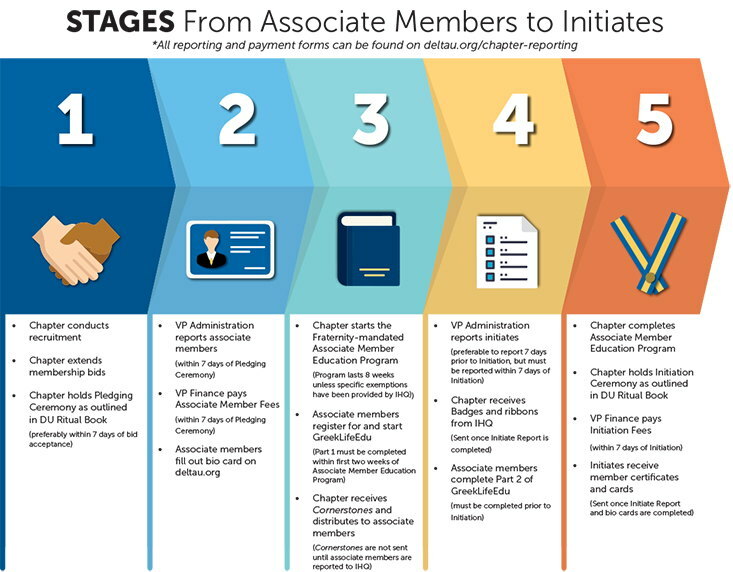 Chapters are able to download PDF versions of the Associate Member Education Program Facilitator Guide and Workbook and print them at a local print shop for use. These books can also be purchased from Delta Upsilon International Headquarters as part of an Associate Member Education Program Pack. Packs are $10 each plus shipping. To purchase email ihq@deltau.org or call 317.875.8900.